In many ways this is the kind of image that I aspire to capture. The subject is active, engaged in probing the flower with its extended proboscis, rather than in a static pose. Of equal importance, the image has an artistic feel, a kind of beauty in its composition and colors. There are so many uncontrollable elements in nature that there is no way to guarantee results like this, but it is sure is nice when it happens. 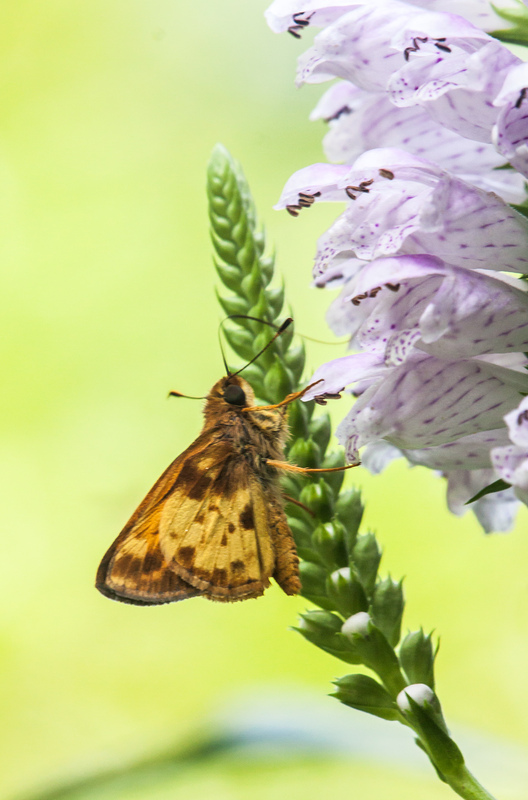 UPDATE: Helpful folks on Facebook and readers of this blog have helped to identify the butterfly as a Zabulon Skipper (Poanes zabulon) and the flower as an Obedient Plant (Physostegia virginiana). Thanks, Drew and Molly. Normally I aim for extreme realism when taking photos. 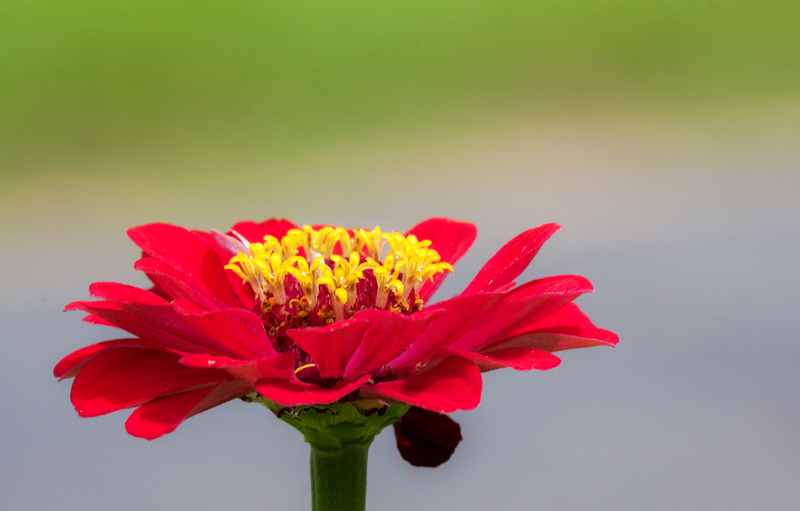 Sometimes, however, I like to try an “artsy” approach, like in this image of a flower (a zinnia, I believe) from this past weekend at Meadlowlark Botanical Gardens. In this case, I deliberately tried to distort perceptions and make it look like the grass and the sky had switched places. In reality, the blue is not from the sky, but is a gravel path. I like to try to vary the angle at which I am shooting and the results can often be fun and different. I never know when I will find myself sprawled on the ground or standing in the mud, so I tend to wear clothes that are rugged and often ragged. It was wonderful to travel to Meadowlark Botanical Gardens in nearby Vienna, Virginia with some friends this past weekend. Although I really enjoy going back repeatedly to familiar spots, sometimes it’s nice to move outside of the “box” and see something different, or at least in a different environment. One of my favorite subjects of our little photo trip was this delightful Green Heron (Butorides virescens) that I spotted at one of the small ponds at the park. 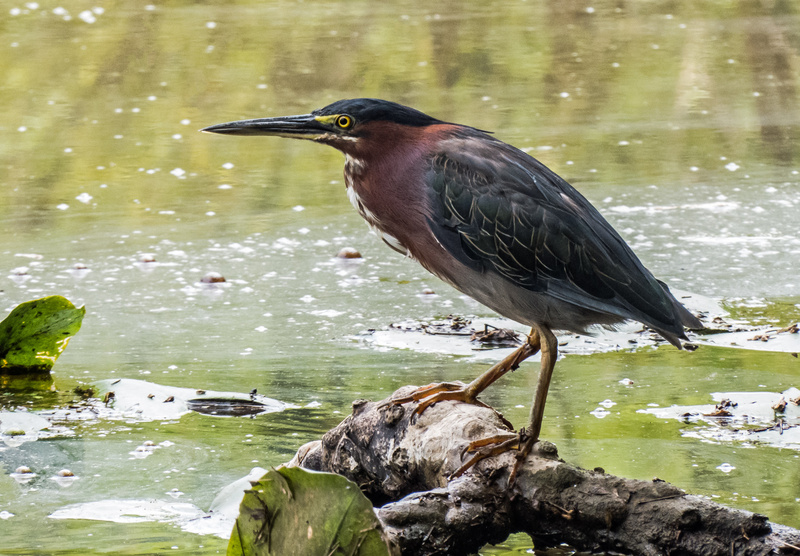 Green Herons are a lot lower to the ground than Great Blue Herons and are often difficult to find. I was lucky to see this one from a distance as I was circling the pond and managed to carefully creep close enough to have a low shooting angle and an unobstructed view. 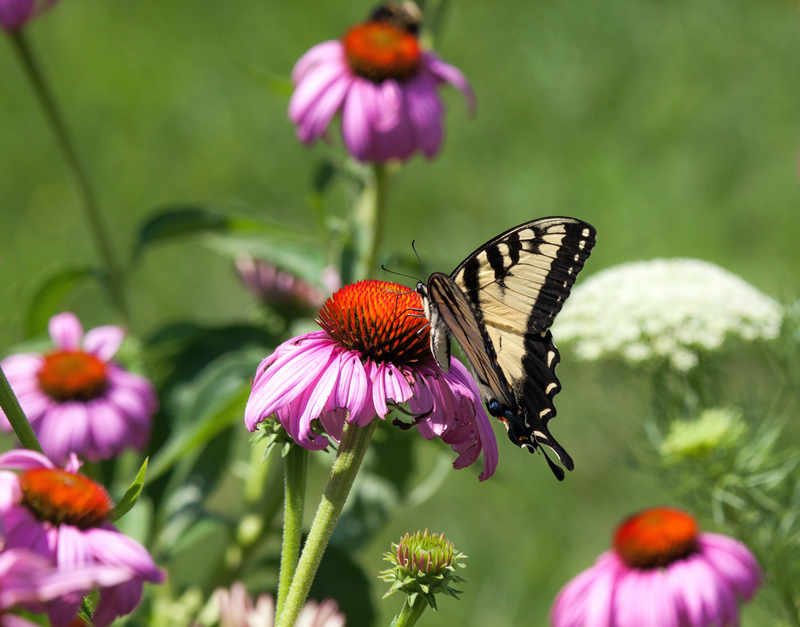 I am always excited to see Monarch butterflies (Danaus plexippus). Over the years there have been numerous reports of this species becoming endangered, primarily because of the loss of habitat. Some years, I have spotted only a few Monarch during an entire summer. This year I have been fortunate enough to see them at several of the locations that I frequent. 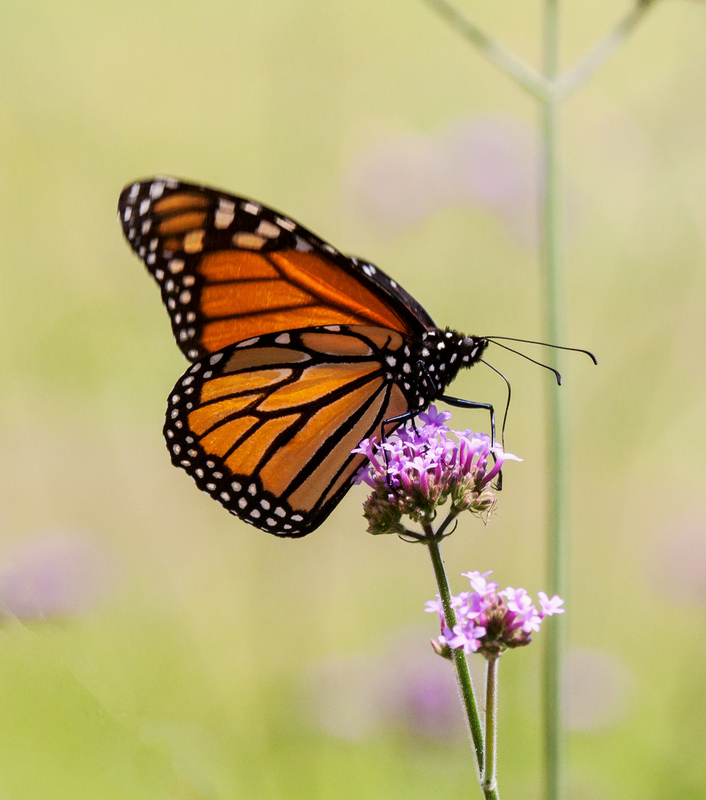 I spotted this spectacular Monarch butterfly yesterday while visiting Meadowlark Botanical Gardens in nearby Vienna, Virginia with some fellow photographers. Each of us has a different style of shooting and preferred subjects and we usually shoot separately. It is always a lot of fun when we reassemble after shooting and share our photos and experiences with each other over dinner at a restaurant. Like many guys, I have trouble remembering anniversaries, so it came as a surprise a few days ago when WordPress reminded me that it was the fifth anniversary of the launching of my blog. Five years old probably qualifies as middle age or maybe even old age for a blog. 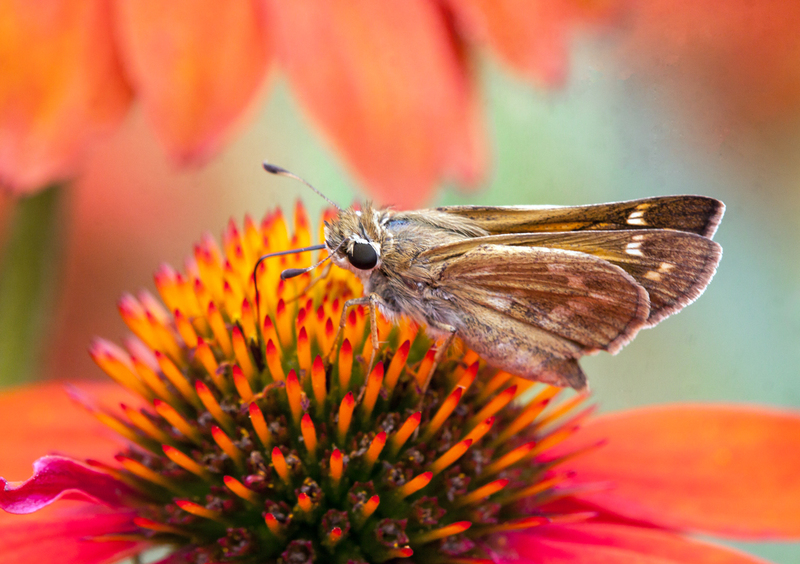 I remember well how my photography mentor Cindy Dyer sat me down and virtually insisted that I start a blog to showcase and share the results of my growing interest in photography. I’ve captured thousands and thousand of images since that time and made close to 2400 postings on this blog. My confidence, awareness, and skills as a photographer have grown significantly. More importantly, though, this blog has helped me to gain a new voice as I have learned to use my words and photographs to express a creative part of myself that has been dormant most of my life. I am very appreciative of the support, encouragement, and suggestions that so many readers have provided these last five years. Thanks to all of you—you have helped to sustain me during times when my energy and enthusiasm have waned. My very first posting was an image of a perching dragonfly and was simply titled Blue Dasher dragonfly. If you look at that posting, you can see that my fascination with dragonflies is not a new phenomenon. It is altogether appropriate, therefore, that I “celebrate” with another dragonfly image. Halloween Pennant dragonflies (Celithemis eponina) generally perch facing away from me. Although it gives me a good view of their spectacular wings, I like it better when I get a frontal view and can look straight into the dragonfly’s eyes. 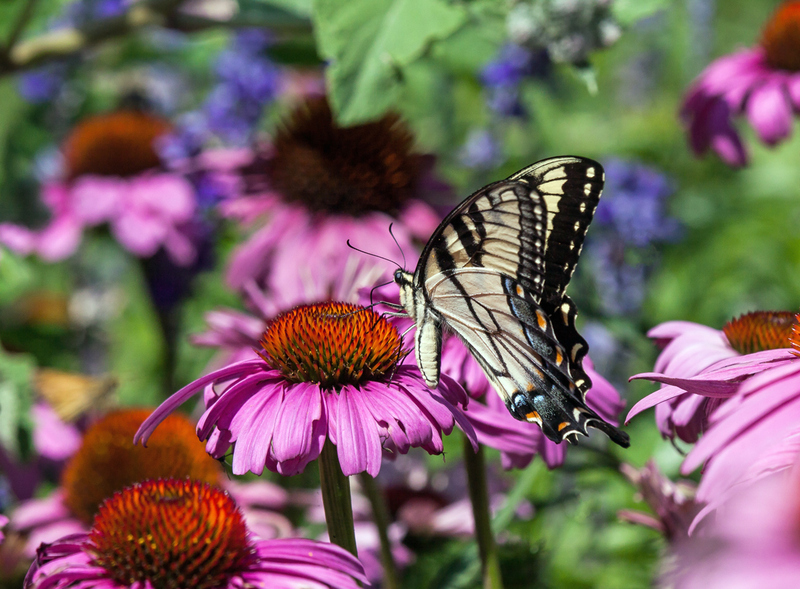 This weekend I found a cooperative subject while exploring Meadowlark Botanical Gardens in Vienna, Virginia, and was able to capture this image. 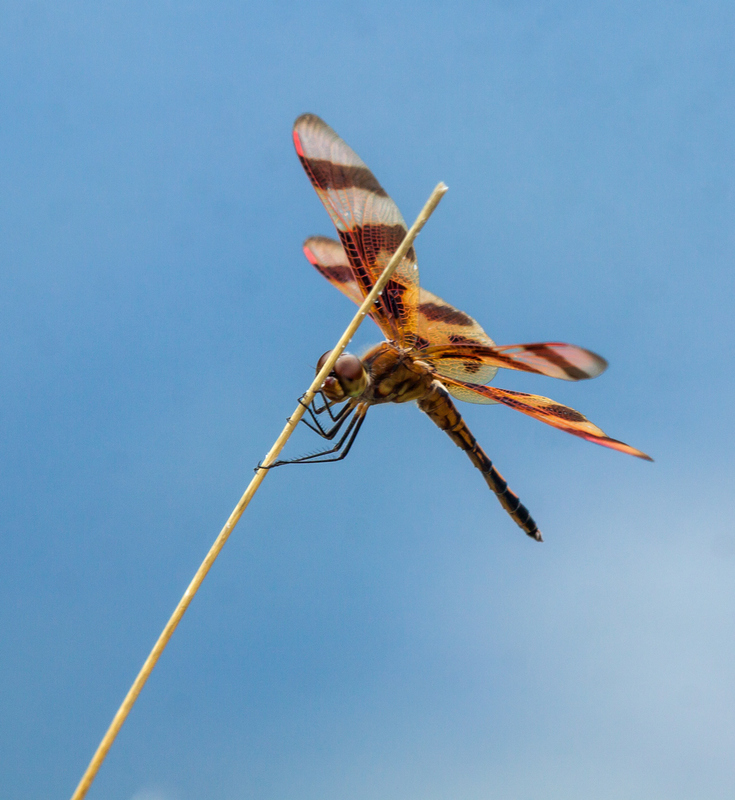 Like this dragonfly, I am ready to spread my wings and fly, resting briefly before taking off again. It’s a bit of a cliche, but from the blog’s inauguration the sub-title has always been, “My journey through photography.” Where will I go next? I honestly don’t know, but I definitely welcome fellow travelers to accompany me on my continuing journey of exploration. Perhaps I will set my sights really high and point my camera, to use the famous words of Buzz Lightyear, “to infinity and beyond.” Come fly with me. 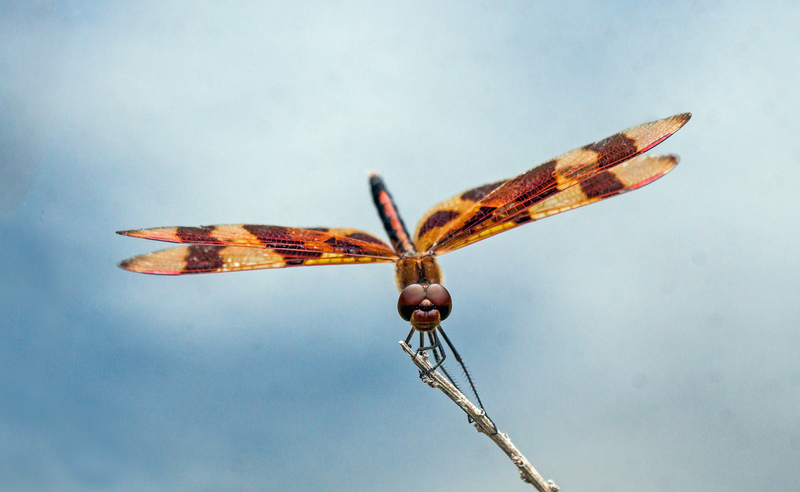 As the breeze kicked up yesterday at Meadowlark Botanical Gardens in Vienna, Virginia, this male Halloween Pennant dragonfly (Celithemis eponina) hung on tightly to his perch. From the angle at which I was shooting, though, it looked like he was participating in a pole vault competition.